I knew this cake would be special from the first email. *interject warm smile here* My contact for this wedding was the Mother of the Bride, and this Momma knew my family and my husband’s family from past to present! She also knew what she wanted, and was prepared at the consultation… for every question I had, she was ready with a quick answer. Prepared. One of my favorite things when it comes to helping determine the perfect cake for each couple is a clear direction from someone who isn’t afraid to share their thoughts while at the same time being warm and engaging. I thoroughly enjoyed every contact involved with this wedding. It’s so much easier to work with a family who genuinely loves well, and this was definitely one of them. I prefer and always strongly suggest a picture of what is wanted be sent to me right off, that way I can get a feeling of the level of expectation. The sent picture or pictures also help me determine if I can even create the cake of their dreams. I know I won’t often get a chance to create a new design, but I will get to add my own personal touch and flair if given the chance. For this wedding Mrs. Momma found pics of what she liked, which meant I was going to get to have some FUN and create a wedding cake surprise for the happy couple! Lots of cake flavors for this wedding! 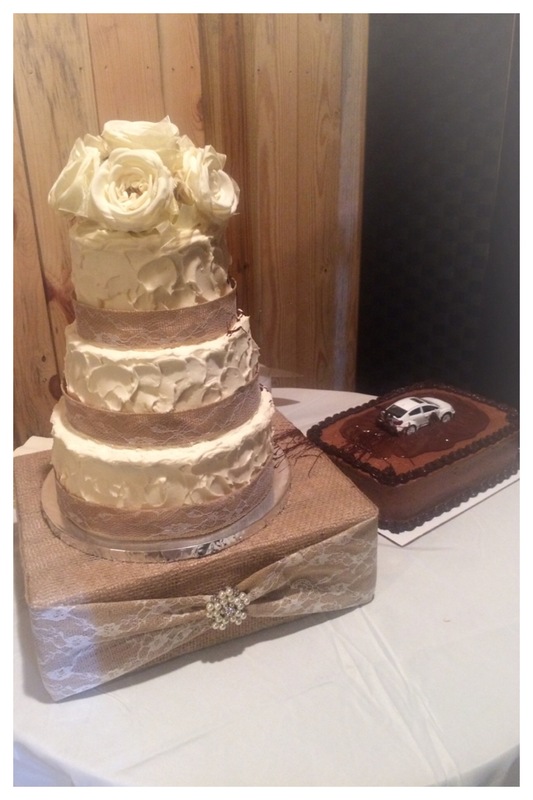 The bottom tier was a carrot cake with a cream cheese filling, the middle tier was a red velvet cake with a cream cheese filling, and the top tier was vanilla cake with my delicious vanilla buttercream for the filling as well at the finish frosting for the entire cake in buttercream white and a hint of blush with a rough swirled textured finish. Embellishments included burlap and lace ribbon with a silk rose topper. The Groom’s cake was a chocolate fudge cake with a Hershey’s chocolate frosting. 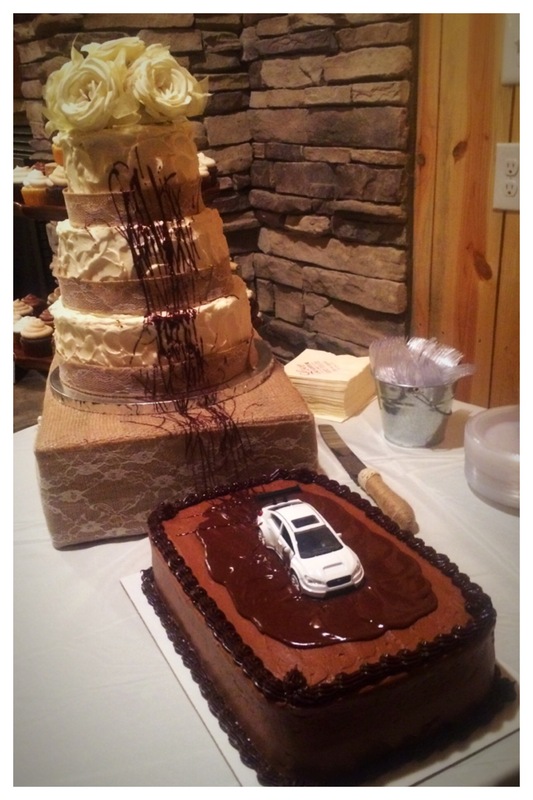 Embellishments for “his” cake included a car that resembles one on the movie “The Fast and the Furious.” Now this car is spinning it’s wheels in the frosting and totally slinging some delicious chocolate onto the beautiful wedding cake. Classic boy move. What a fun couple! What a fun Momma! 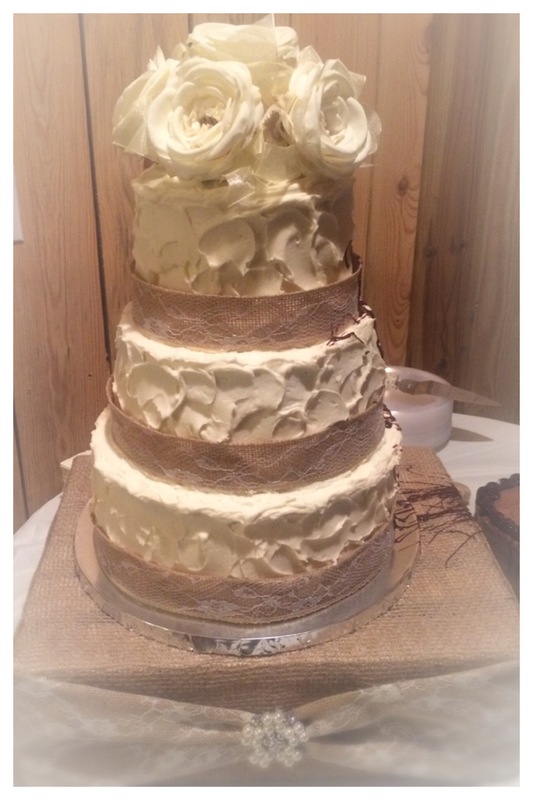 I delivered the wedding cake surprise to a newly built rustic barn located in Greenback, TN at The Barn at Meadow Farms. Mrs. Momma was waiting for me, and was absolutely thrilled to show the cakery to the Mother of the Groom and other family members. I can’t wait to hear from this family and see pictures captured of the reveal moment for this bride and groom.